Company acquires initial interest of 70 percent in PR 2461 in the DRC copperbelt. 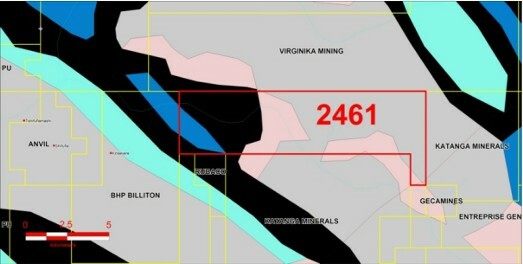 Research permit is located just east of the Kinsevere Project of Anvil Mining. Option to earn 85 percent. February 4, 2008, Vancouver, BC -- El Niño Ventures Inc. ("El Niño") (TSX.V: ELN; OTCBB: ELNOF; Frankfurt: E7Q) is pleased to announce an agreement with MIMECO AG (MIM) to acquire a 70 percent interest in PR 2461 in the DRC under the terms specified below. El Niño will be the Operator and will be responsible for all exploration costs. This Agreement is subject to regulatory approval. This Permit is situated just east of the Anvil Mining Kinsevere project. It has excellent accessibility and its geology makes this a highly prospective copper and cobalt project. This Permit, which covers more than 55 square kilometers, is principally underlain by the highly prospective Roan Formation, which hosts most of the important copper deposits in the DRC Copperbelt. Comprehensive airborne geophysical surveys and geochemical surveys are planned for 2008. The Company anticipates it should also be in a position to carry out initial drilling in this area during 2008. Jean Luc Roy, President of El Niño states, "We look forward to working with MIM in maximizing the potential of this research permit. This acquisition fits into our overall corporate strategy to selectively increase our land position in the DRC through the acquisition of quality exploration ground. Our objective is to build a mining company by delineating proven reserves and placing them into production. We are now finalizing our 2008 exploration program which will include a substantial drill program planned to test several targets delineated on Research Permit 5217 during the 2007 exploration program. We also plan to drill test other areas of our landholdings which we have prioritized from the analysis of our airborne geophysical surveys. Under the terms of this Agreement El Niño acquires an initial 70 percent interest in PR 2461 by issuing 200,000 shares of El Niño to MIM, subject to regulatory approval and ELN making an exploration commitment of $1,500,000 over three years. $500,000 must be spent in the first year of the agreement. A new SPRL Congolese company will be created whereby El Niño will hold a 70 percent interest and MIM a 30 percent interest. El Niño has the right at anytime to increase its interest to 85 percent by paying MIM the sum of $15,000,000. The issuance of shares to MIM will be made once the title of PR 2461 is transferred into the new SPRL company which is now being incorporated.